This extremely cool subway map via soybits.com displays technology and publishing trends for 2008-2009 as a subway map. It shows the connections between publishers, ebook gadgets like the Kindle, mobile, book formats, and other 'landmarks' that made news in 2008. I also love that they offered to add in any crucial books they might have missed if you email them by Feb. 4th. Here's your chance to collaborate on a new book and gain some timely, financial advice from the bestselling author of RICH DAD POOR DAD, Robert Kiyosaki. Conspiracy of the Rich is a new book in development by Robert Kiyosaki, the bestselling author of Rich Dad Poor Dad. This book will be free, online, chapter by chapter, & readers are encouraged to read, ask questions, post opinions & contribute their points of view on the subject. * Full disclosure: I am employee of HBG. In case anyone had wondered if blogging was really mainstream now, in case the 13 million blogs out there wasn't enough proof, yesterday the White House got a blog. Yes, ladies and gentleman, at few minutes after noon, when Obama officially became our 44th president, a new blog post went up. Obama is truly the coolest dude on the planet and boy, is he making all of us proud. Watching last night's inauguration balls and the news commenters, after spending much of my day at work watching the actual live feed on my PC, surrounded by a sea of coworkers doing the same and feeling the collective delight, joy and hearing the occasional clap or tears, I realized that our country is in love with our new president and his family, Michelle, Malia and Sasha. Like a brand new mother or father enraptured with a newborn infant's five perfect fingers or eagerly inhaling that new baby smell. Like an infatuated teenager sighing at the way his/her crush's hair falls just so or smiles or laughs. 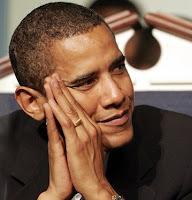 That's what we sounded last night, when we all delighted at Obama's use of "old school," or the way he held Michelle or so many other things about him (and her) that we find compellingly refreshing, charming, down to earth, delightful, beautiful, strong, and inspiring. We have fallen in love. Perhaps, it's my own tendency to idealize and romanticize. Perhaps, it's something we all do. I think the romance and honeymoon has just begun and we've been waiting all this time to exhale. Do it with me. Exhale, release, accept it. He is ours now, at least for the next four years. New Yorkers have a reputation for being tough, cynical and sometimes worse. I was thinking about this the night before last when I got to my bus stop, only to find the entire block blocked off by construction. I thought maybe the bus driver would cut me some slack and maybe stop at the corner so I stood there and tried to flag the bus down. It was cold and when the bus finally came it went right by me. So much for that. I take the express bus since I live in the outer edges of the city and otherwise would have to take both the subway and then a local bus. We don't even have a train stop in my area, isn't that a shame? So I decided to walk down to the next stop, which was several blocks south. Incredibly, when I got to the next bus stop on the route that block was also blocked off by construction. By this time, I was tired and furious at the MTA. No signs were posted, no notice was given and later when I checked their site online - I didn't find any information there either. I asked one of the construction workers about any possible alternate stops hoping he might know but he just pointed me in the direction of the regular bus stop. After attempting to call the MTA, 311 and then W to pick me up to no avail, I finally asked the female driver of a bus that had pulled up. She tried to help me and after a little bit of back and forth she suggested I hop on her bus and she would drop me off further uptown past the construction. I sat down in her bus in awe. Sometimes you get so caught up in how things are supposed to be that reality takes you aback. How very kind and considerate of this bus driver. I was cold. I was tired my feet hurt and I was beginning to get anxious about getting home. I had already walked a ways and then walked more trying to find an accessible bus stop. The idea of walking another seven or ten blocks down to another stop was not appealing. Her kindness made me remember other similar kind gestures. The stranger who drove me the last mile to my mom's house, after I had walked 5 miles on 9/11 and refused to accept my offer of money for gas. The man (during a snowstorm and he was the only person on the road - an eerie site in NYC) who saw me walking and stopped to offer me a ride. The coworker/classmate who offered to drop me off at the airport because it was right on her way home. She then also gave me her phone number, just in case, my flight was delayed or something happened to me - strange girl, in a strange town, who knew no one. The teacher who anonymously paid for my senior trip so that I wouldn't miss out on the experience. The neighbor who offered to get me a can of mace because he saw me getting off the bus late at night by myself. The list goes on and on. Some of these actions may seem trivial at least to those who so humbly put them forth but it is that spirit of "it's nothing" combined with the unexpected surprise that a stranger would even care with the kind gesture itself that leaves one completely touched. Chris Brogan had a great post, The Kinds of Products I Want to Touch in 2009, about reviewing products and what he wants to review on his blog this year. I thought it was a great blog post because it speaks to his needs and those looking for some good reviews and blog buzz. I thought I'd do something similar to Chris and also http://www.luxlotus.com/ Windowlicker, which is genius, basically I'm posting stuff I've spotted, would love to try or own and think very highly off. - biOrb - I've wanted a small one for my workspace since they debutted and now they have a new line called the biOrb Life Collection, with a sleeker design. Although I think the baby biOrb is perfect at 4 gallons and also the most affordable. - Luxury Soaps from Gilchristsoames.com. I've always loved fancy soaps and after using one a Gilchrist & Soames Chamomile Exfoliating signature soap during a hotel trip, I was hooked. The soap smells absolutely splendid and the light, clean smell remains on your skin long after you have showered but because of the natural exfoliating elements of the soap, you feel clean and not like you been covered in lotion like some other soaps. At first, I thought the soap was made from green tea or tea tree oil because of that clean feeling it left on my skin but I was delighted to find it was made from chamomile instead. One really cool factor is that the soap contains small pieces of (what I believe is) dried pieces of chamomile leaves that actually resembles chopped nuts and once you begin using the soap they stand out and exfoliate while being visuallly appealing as well as olfactionary pleasing too. Of course, they cost more than you might regularly pay for soaps but with brand name, perfumey (and lotiony) soaps costing more and more these days these soaps have got the competitors beat with visually interesting soaps, natural products and the great sensations of clean, soft skin. My SO and I spent a week in the Dominican Republic over the New Year holiday. It was spur of the moment and whirlwindish and was aboslutely thrilling. And, although the the hotel was that nice, in fact the food made me sick and the beach was nicer on the other side of the fence, we still managed to have fun and ride the teleflorica up to the top of the mountains, snorkel and see tropical fish, and sleep and sunbathe on the beach for a few days. I was thrilled to discover the Mirabal sisters ', made popular in In the Time of the Butterflies by Julia Alvarez, beautiful faces printed on some of the Dominican Pesos and also travel down the avenue named after them. I also took advantage of the free time to read my Sookie Stackhouse novels and they also seemed like a breath of fresh air and perfect 'summer' reads. While there I had a chance to touch a toucan and I must tell you that a toucan's feathers feel like silk. I was delighted to discover this fact. It was really a great begining to the new year and so refreshing! (read more here), which will contain all of an author's book plus profile info, like photos, bio and even video. Sweet! mashable.com reviewed Reading Trails, a new social network that takes a fresh approach to discovering books online by following users' trails and finding intersections or connections. It's cute and offers widgets so you know I like it. I also discovered a few book communities that I was completely unaware of; "JacketFlap is the world's most comprehensive children's book resource and social networking web site for people interested in children's and young adult books." While "Big Universe® is an award winning web community devoted to beautiful children's picture books" and seems similar to Lookybook. Completely new to the web is www.booksprouts.com, a book community with a focus on book clubs. You can catalog books, post reviews, make friends and also join, create and manage your own online book club and make recommendations. Oprah's having a live webcast for The Story of Edgar Sawtelle author David Wroblewski on Monday, January 26, at 9 p.m. ET/8 p.m. CT.
www.podiobooks.com offers free audio books to download. Death with Interruptions by Jose Saramago sounds like a fun but intelligent read. www.indiebound.org has a great new look for 2009 with cool community features too. www.simonandschuster.com also relaunched their website. Poets & Writers Magazine now has a blog! Check it out at: www.pw.org/blog, their main site, www.pw.org, also got a revamp. James Patterson, has a great new community dedicated to making lifelong readers out of children at ReadKiddoRead. It looks great and has a ton of resources! Lots of makeovers for 2009: Guanabee.com also has a new, very pink look, in addition to a book club: (read full post here). Their first pick is Chilean author Roberto Bolaño’s 2666, which I started reading last month but after a few pages put it down for another time because I just couldn't get into it at the time and I want to give it a fair chance. AbeBooks' Lists their Most Expensive Sales of 2008, See the whole list. Designspongeonline.com posted a guide to Harlem and I would love to see one for Spanish Harlem. That reminds me too, the Bronx is totally getting some love at The Bronx Rocks.